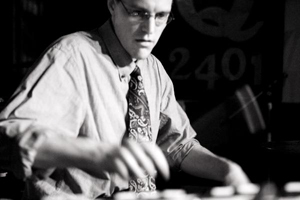 When performing live, Reid Karris uses his drum kit and contact mics to make loops of drum sounds, keyboards, xylophone, bells, singing bowls and various noises of all kinds. He also records albums featuring guitar, drums, and keyboards, occasionally featuring other musicians. He is quite prolific.